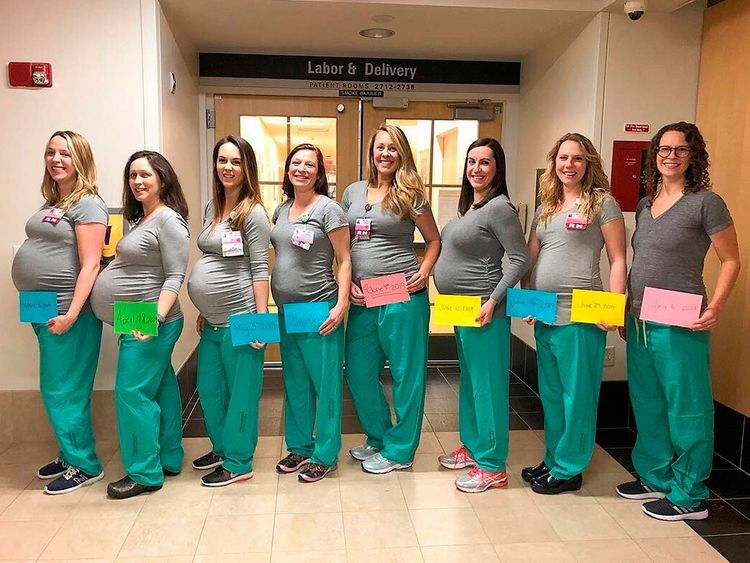 "Throughout the shift, we'd name the people [who were pregnant], and we were like so and so, so and so, and so and so," one of the pregnant nurses at Maine Medical Center in Portland told NBC on Monday. "Then we got to two hands and were like, Whoa!" "Something is definitely in the water here at Maine Medical Center on the Labor and Delivery Unit!" she wrote. "Lots of baby friends being made this summer!" The hospital followed by reposting the picture. "How's this for a baby boom?" the hospital wrote. "Congratulations!" "It's comforting knowing we'll be taking care of each other," Samantha Giglio, one of the nurses who's expecting, told News Center Maine. There are 80 registered nurses working in the hospital's labor and delivery unit, the outlet reported. The hospital told some expectant mothers who said they were worried about the hospital's staffing needs that everything was going to be fine. "I'm curious if there will be any L&D nursing staff at MMC when I deliver at the end of June," one wrote. "Don't worry!" the hospital responded. "We have a plan." The hospital did not immediately respond to a request for comment from The Washington Post.